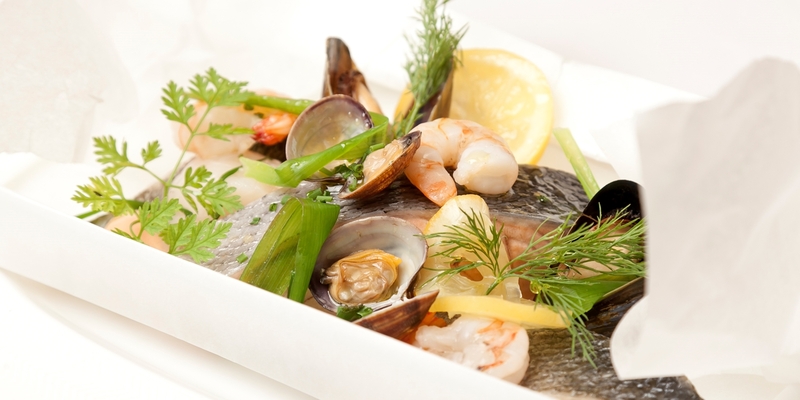 Cooking fish in an oven can be a healthier way to serve seafood, and it doesn't take away from the great flavours and textures that fresh fish has to offer. In fact, Luke Holder uses this method to intensify the depth of flavour in his fish stew by first roasting the fish heads and bones he uses for the soup base. Our collection of baked fish recipes includes quick and easy dishes such as Andy Waters' baked cod with tomato sauce, or William Drabble’s mackerel with salsa and fishy crisps, both of which make great midweek meals to cook and serve with kids. Two other common ways to bake fish are en papillote and in salt, both of which encase the fish so that it does not dry out while cooking. Josh Eggleton adds fennel and herbs to his salmon en papillote, while Lisa Allen bakes sea trout in a salt crust and serves with buttered cockles and new potato salad.